Alex Hawkins was the first student in his high school’s history to letter in four sports. Not only was he selected to the West Virginia high school all-star football game, he served as captain for the North team and was named most valuable player. Although he received 23 basketball scholarships and only five football offers, he chose a football grant to the University of South Carolina where he played end and halfback on offense and backed up the line and played safety on defense. That refrain provided the title for his first book, My Story and I am Sticking To It a recounting of his life in the NFL. Hawkins’ published works also include two cookbooks, and he is currently working on a third. He first demonstrated his way with words by providing color analysis for CBS’ NFL telecasts in the 1970s. Hawkins, who is now is retired and living in Denmark, SC – about 65 miles east of Augusta – with his wife Charlie, was born and raised in South Charleston, W.Va.
At South Carolina, he was named Player of The Year in the Atlantic Coast Conference, (1958). He has since been inducted into the USC Hall of Fame. With the Colts he was special teams captain under both Weeb Eubank and Don Shula and played linebacker, cornerback, safety and wide receiver. When Hawkins, then a South Charleston high school senior, was being sought after by football and basketball college coaches, he chose football because it paid more money. “I was offered a farm to sign with the University of Kentucky but I was offered $1,500 a semester, a complete men’s wardrobe and a new automobile to play football for coach Rex Enright at South Carolina. In the introduction to Hawkins’ memoir, sports writer Dan Jenkins wrote, “The first time I ever saw Alex was when he came down to Austin, Texas, in 1957 and tore the Longhorns’ asses up in a game South Carolina won, 27-21. It was coach Darrell Royal’s first season at Texas. 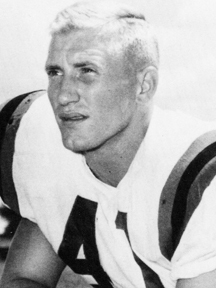 Hawkins was claimed by the Atlanta Falcons in the 1966 expansion draft. It was a match not made in heaven. “I knew this was not going to work at one of our early team meetings,” he recalls. Coach Hecker later said, “I don’t care if he catches 40 passes a game he is not going to play for me.” Hawkins was traded back to the Colts, finishing his career in 1967.